Veldig viktig studie som nevner at det ikke finnes glatt muskulatur i kapillærene, så det er arteriolene som avgjør blodsirkulasjonen i kapillærene. His blodsirkulasjonen i en arteriole blir dårlig stopper sirkulasjonen opp i et område av muskelen som serveres av kapillærene. The rising incidence of diabetes and the associated metabolic diseases including obesity, cardiovascular disease and hypertension have led to investigation of a number of drugs to treat these diseases. However, lifestyle interventions including diet and exercise remain the first line of defense. The benefits of exercise are typically presented in terms of weight loss, improved body composition and reduced fat mass, but exercise can have many other beneficial effects. Acute effects of exercise include major changes in blood flow through active muscle, an active hyperemia that increases the delivery of oxygen to the working muscle fibers. Longer term exercise training can affect the vasculature, improving endothelial health and possibly basal metabolic rates. Further, insulin sensitivity is improved both acutely after a single bout of exercise and shows chronic effects with exercise training, effectively reducing diabetes risk. Exercise-mediated improvements in endothelial function may also reduce complications associated with both diabetes and other metabolic disease. Thus, while drugs to improve microvascular function in diabetes continue to be investigated, exercise can also provide many similar benefits on endothelial function and should remain the first prescription when treating insulin resistance and diabetes. This review will investigate the effects of exercise on the blood vessel and the potential benefits of exercise on cardiovascular disease and diabetes. At rest, a low proportion of capillaries are exposed to blood flow at one time, with a rapid increase in the number of perfused capillaries after exercise , thus increasing functional capillary density. Vascular smooth muscle cells are located around the arterioles and some venules, and can constrict to change blood flow patterns, while capillaries do not typically contribute to blood flow changes  (Figure 1). Blood flow through capillaries is controlled upstream by small arterioles at rest, and the rapid recruitment of unperfused capillaries by exercise could suggest that nerves are responsible for this action . The sympathetic nervous system is mainly responsible for the vasoconstrictor responses, and as the arterioles and larger vessels are innervated  the majority of sympathetic nervous system activity is localized to that area of the vascular tree. Physical exercise can enhance sympathetic nerve activity  to maintain arterial pressure, and may be involved in maintaining exercise tolerance, as reviewed by Thomas and Segal . Structural differences between artery, arteriole and capillary. 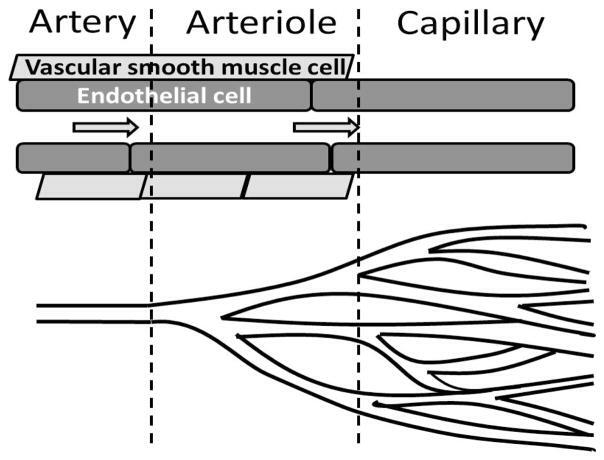 No vascular smooth muscle is located on the capillary; therefore flow through capillaires is modified by pre-capillary arterioles. Cessation of flow through arterioles will prevent flow through a portion of the muscle. Insulin relies on endothelium-dependent vasodilation to enhance perfusion, thus endothelial dysfunction reduces insulin-mediated increases in muscle perfusion, which can contribute to the metabolic deficit in diabetes. As exercise-mediated changes in perfusion are typically endothelium-independent, exercise is still able to recruit capillaries and thus increase muscle perfusion in obesity and type 2 diabetes, even in the face of endothelial dysfunction. Numerous studies have now shown that while insulin’s vascular effects may be blocked in diabetes, exercise still maintains its ability to increase the distribution of blood flow through muscle . Nitric oxide (NO) is the main vasodilator from the endothelium specifically involved in blood flow and blood distribution, and while reduction in nitric oxide synthesis lowered total blood flow, exercise-mediated capillary recruitment was not affected . In fact, inhibition of NO formation enhances both resting and exercise-mediated muscle oxygen uptake ; despite a reduction in total flow, microvascular flow was not affected, suggesting that NO is not involved in the vascular response to exercise. The distribution of blood through muscle increases the capacity for nutrient exchange. In exercise the primary purpose of functional hyperemiais for oxygen delivery, as the oxygen required by exercising muscle is much higher than resting muscle (reviewed in ). Recruitment of capillaries can decrease the velocity of blood flow by increasing the cross-sectional area of the capillary bed and the time available for exchange. Recruitment also increases surface area for exchange and decreases perfusion distances to promote oxygen delivery to tissues with exercise  (Figure 2). While in exercise the main metabolite required at the working muscle is oxygen, distribution of other nutrients can also be affected, including glucose, fats, other hormones and cytokines. Muscle metabolism can therefore be altered by perfusion of the tissue [48,49]. While there can be regulated transport of certain larger hormones across the vasculature [50,51], smaller molecules can diffuse across the endothelium easily, possibly making muscle perfusion a more important player in the delivery of glucose and oxygen to the tissue. Vasodilation affects delivery, and thus metabolism. The rate of transfer across the endothelium is dependent on surface area, permeability of the endothelium, diffusion distance, and concentration difference (Fick’s first law of diffusion). 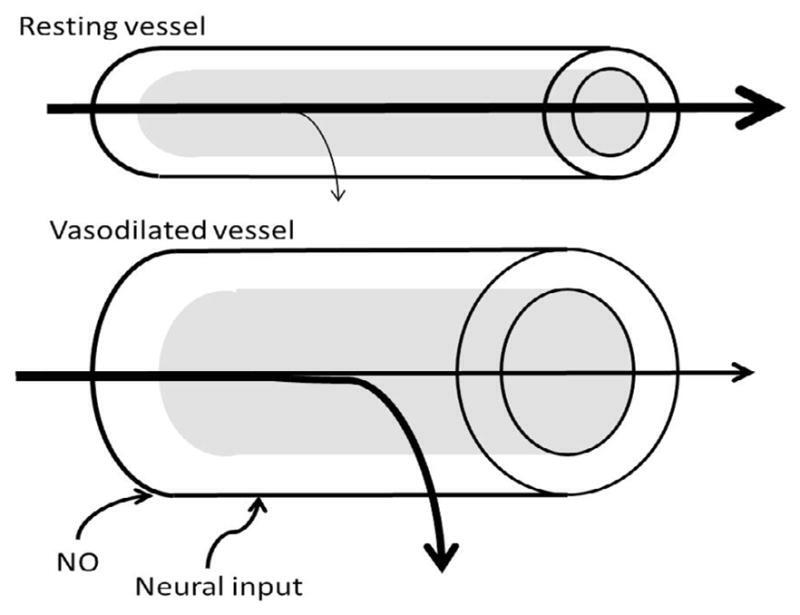 Vasodilation increases surface area in arterioles for exchange, but will also recruit downstream capillaries, which will reduce diffusion distance and increase surface area for exchange. Working muscle increases oxygen utilization, increasing the concentration difference from the blood vessel to the tissue. Mitochondrial dysfunction has been proposed to be both a cause  and a consequence  of insulin resistance, and may contribute to endothelial dysfunction . If oxygen delivery is a component of mitochondrial health and biogenesis, it is possible that impaired perfusion may contribute to fiber type switching, where an oxidative fiber, which is typically highly vascularized and contains mitochondria, switches to a glycolytic fiber with less vascularity and mitochondria. As exercise can improve oxidative capacity, increase mitochondria content , and also increase muscle perfusion [31,32,34,45,76], the relationship between muscle perfusion, fiber type and mitochondrial function needs to be clarified. The vascular component of exercise may well be linked to the reduction of diabetic complication such as retinopathy, peripheral neuropathy and nephropathy, as there is a vascular basis to many of these complications. The endothelium has been implicated in diabetic nephropathy , and the blood vessels formed in response to reduced perfusion in retinopathy show abnormal structure and function . Spennende studie som nevner at blodsirkulasjonen øker i området som har stølhet. Og den økte blodsirkulasjonen vedvarer i mer enn 48 timer etter treningen. I dette tilfellet i leggen som ble trent. De mener det er pga økt betennelse i muskelen. There was a significant main effect for time for blood volume (p=0.023) and blood flow (p=0.010), with no significant difference in blood flow velocity (p=0.316). There were significant increases in blood volume (p=0.001) and blood flow (p<0.001) immediately postexercise (9.77 ± 3.19 dB and 3.53 ± 0.86 dB/sec), respectfully in the contralateral limb compared to baseline (6.18 ± 2.05 dB and 2.40 ± 0.69), with no change in blood flow velocity (p=0.487). The effect size for blood volume was 1.34 (0.09, 2.60) and blood flow was 1.41 (0.15, 2.68). The increases in contra lateral blood volume (p=0.002) and blood flow (p=0.003) were maintained at 48 hours (9.41 ± 1.90 dB and 3.51 ± 0.47 dB/sec) compared to baseline, with again no change in blood flow velocity (p=0.411). The effect size for blood volume was 1.62 (0.32, 2.92) and blood flow was 1.86 (0.51, 3.22). There were no changes in blood volume (p=0.814), blood flow (p=0.962), or blood flow velocity (p=0.493) between post-exercise and 48 hours for the contra lateral limb. Following eccentric exercise to a single limb, the contralateral limb resulted in increased blood volume and blood flow immediately after exercise and at 48 hours post exercise. From previous research in our lab  immediately after eccentric exercise, blood volume and blood flow increased in the exercise leg by 42% and 80%, respectfully. From this study, the contra lateral leg increased 17% and 35% for blood volume and blood flow, respectfully. This finding supports earlier work by Seals  and Taylor et al. that identified vasodilatation of the contra lateral limb after exercise initiation. Blood flow velocity did not change in the contra lateral limb after exercise and at 48 hours. Since this limb was not exercised, recruitment of capillaries is not necessary, as would be in exercised muscle . Eccentric exercise increased microvascular perfusion immediately after exercise in the contralateral limb, which had not been examined before. The increased perfusion was maintained over 48 hours, so the prolonged increased in perfusion of the contralateral limb may have been due to an inflammatory response or the extra demands placed on the contralateral limb for support during walking.